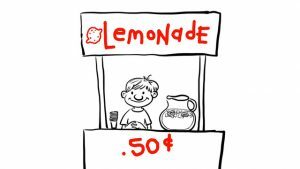 Remember running your first lemonade stand? It was fun! It taught you about handling money, service with a smile, and to only use half the container of lemonade mix per pitcher instead of the whole thing! But what you didn’t learn was something that we as business owners know all too well: there are lemonade stands in front of every single house on the street and all of them claim to have the best lemonade! 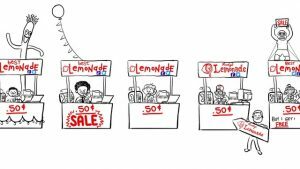 Free enterprise is a beautiful thing, but it sure makes it hard to sell lemonade. As technology has evolved, so has the prescription for getting noticed. In the old days, all you needed to have was a business phone number. Over time you needed to add a fax machine, and later a website! Fast forward to today. Social media pages are what everyone uses.As the trend changes, so do all the lemonade stands, each trying to get an edge on the market to stay two steps ahead of the competition. And people will do anything to get noticed! I’m pretty sure I’ve counted more sign-spinners on street corners in 2017 than I have ever seen in my life. And even though it’s true that people’s attention is scientifically drawn to color and movement, there has got to be a way to rise above the “dancing bear” technique to grow your business! What about fireworks? Yes. Fireworks. I don’t care if you are 5-years-old or 100 years-old, anyone who watches fireworks says “Ooh!” and “Ahh!” Just check out the amazing pictures in a quick Google search. There is something magical about watching fireworks. “How… Do… They… Do… That?!! !” And when the fireworks are through we all want to know one thing… which one of these lemonade stands fired them off?! Whiteboard animations are like fireworks. There is something magical about watching someone draw something in front of you. Like when you’re watching a street artist, you don’t want to walk away until you see what they’ve painted… the payoff isn’t until the very end. Whiteboard animations have the highest percentage of audiences watching them until the very end. That’s not just magic, that’s lightning in a bottle! What could you do with lightning in a bottle? Let’s start with selling more lemonade. How do you get started? Contact Rhett Creative for a free consultation or visit us online to learn more about whiteboard animation. Give Rhett a call at 214-695-5560, or send an email to rhett@rhettcreative.com. This entry was posted in Client Help and tagged animation, whiteboard. Bookmark the permalink.